Two days after shocking many with her abrupt retirement, DEEP Women’s Lightweight (106-Pound) Champion Miku Matsumoto publicly addressed her decision to walk away from mixed martial arts earlier today. 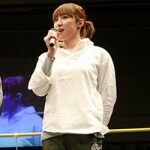 Citing a lack of desire to continue competing, Matsumoto offered thanks and apologies to her fans and fellow female fighters. While she did not directly discuss the reasons for her loss of interest, Matsumoto stated that she had become detached from the sport and training and had no regrets about her decision to retire from MMA. Translation courtesy of Roxanne Modafferi from Matsumoto’s original blog posting in Japanese here. Since after my fight last year, I’ve been feeling something even I didn’t understand. Up till now, I’ve been pushing forward only for the sake of making myself stronger. In the midst of that, I started to feel something changing. From when I first started MMA, I’ve always thrown everything into my training and given it all during my fights with no regrets. Regardless of when I retire, I want no regrets. This emotional strength and willpower has always helped support me. I’ve been doing MMA for 5 years. When the time comes that I can’t go out and give my entire self to MMA, it’s time for me to retire. This is my personal belief. I think that time has come for me. However, this decision not only affects me, but also those around me. I hold the DEEP championship title, and those around me, fans and everyone at the gym, hope to see me fight. Everyone has been saying that they hope to see me fight Megumi Fujii. I was really troubled over this, but I can’t train hard or go into a fight feeling this way. This is what I regret the most, and I want to apologize to everyone. I’m afraid that I didn’t sum this up very well, but please don’t be sad about this for me. After all this time, I have no regrets, and I feel like I can retire with pride. I’d like to thank all the fans for your support all this time. Truly, thank you so very much. On April 17th at DEEP 48 Impact, I’ll be going to the retirement memorial ceremony and exhibition match. I want to express my appreciation and put on one last spectactular showing. Until then, I’ll push myself just a little longer. Please come watch! MMARising.com will continue to follow any further developments and hopes to speak with Matsumoto soon. We wish her the best for her future away from mixed martial arts.